The Consulate General of the Republic of Poland in New York invites you to participate in a large-scale promotion of the name of Jan Karski. Just take a picture on the bench at 233 Madison Ave and 37 St. (Jan Karski Corner) in New York and post it on social networks with the hashtag ‪#‎Karski‬ NYC. With such a small effort each of us can make keep his story alive. The first who did it was jazz musician Michal Urbaniak, who is currently touring in the U.S.
One can sit on a bench to relax, forget for a while about the fast pace of the city and reflect on the great Pole who, risking his life, told the world about the atrocities of the World War II. 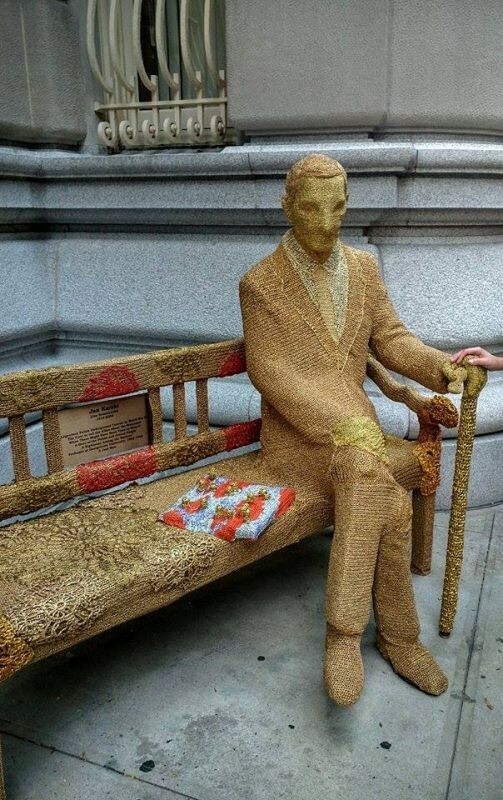 Jan Karski, actually, John Romuald Kozielewski, was born in 1914 in Lodz, Poland, and died in Washington, D.C. He was a courier, political emissary and a witness to the Holocaust. He was able to visit the Warsaw ghetto and the camp from which the Germans were transporting Jews to their deaths. He took pictures and microfilms and become a living witness to the atrocities of war. He worked together with his brother Marian Kozielewski. He presented his reports to the leaders of England and the U.S., and asked them to help occupied Poland. Karski presented his report to whom he could reach – politicians, bishops, representatives of the media, Hollywood’s film industry and artists. Many people could not believe in the cruelty depicted in the report and were inclined to see it as propaganda of the Polish government-in-exile. In 1944 Karski wrote a book “Secret State”, which was published in Boston and made a big impact in the United States. It was only then the Americans learned about the struggle and suffering of the Poles, the role of the underground state, as well as about the extermination of the Jews. The predominant reaction was a shock. Karski’s name should remain known in our time and age, when we witness numerous armed conflicts. Everywhere, there are the heroes who fight with regimes, often risking their own lives. 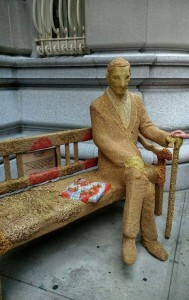 Despite facing so many dangers Jan Karski managed to survive. Thanks to that he could remind others as long as he lived about the horrors of war. Today, when it is gone, it has become our duty to keep his memory alive. Our campaign was launched by Michal Urbaniak, who took his photo next to the statue of Jan Karski. We invite everyone to participate in the campaign ‪#‎KarskiNYC‬!